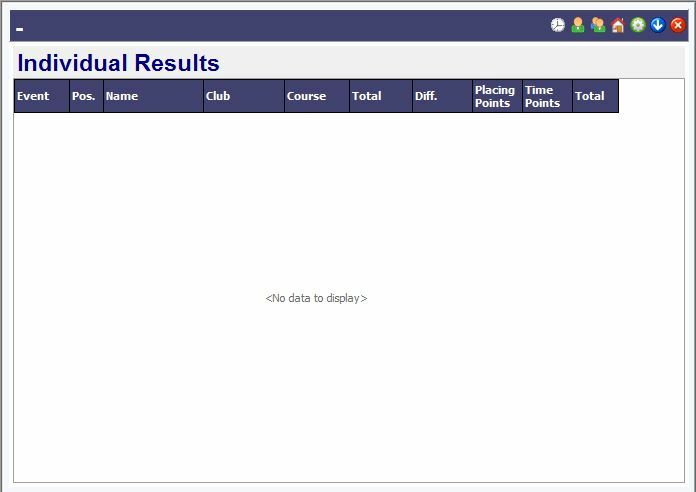 When running a series of races, either the runners are allocated points that get totalled, or the times for each event are simply added together. The O-Lynx Results “Points” screen can handle a variety of ways to calculate points across up to 10 events but it also provides a simple time totalling function as well. Events to be totalled need a way to group them together. In O-Lynx Event, when you set up or edit the event, there is a box called “Group”. This is set to a common code for all the events e.g. For a Sprint Series it might be set to “SS2015”. Now go to O-Lynx Results and from the menu, select “New”, “Points”. A blank Points window will open as shown. Clock – switches between showing times and showing points when on the Grouped Results screen. Single Person – shows the points and time for an individual person for a single event. E.g. at an inter-club event, use this screen to show who earns the points ( maybe the top 3 in each club ) and how many points are being earned. This screen can also be useful when you want to examine how the points are getting allocated for multiple events as you can sort by clicking on the column headers e.g. sort by ‘Name’ to group a single persons results together. Two People – this icon takes you to the multiple events screen which shows either the times or points in separate columns for each event. Blue Down Arrow – Show menu for turning on scrolling of Print or Export the screens. Red Cross – Close the Points Window. When opening a points window, the settings screen will initially be blank so the first step is to give the Setup a name e.g. “Sprint Series” in the box labelled “Points System”. In the “Group” box, enter the code you set against the events e.g. “SS2015”. In this simple example we won’t be using rules so leave this blank. Now press “Save” to save what we have set up so that next time we can just use the “Load” button. Now we need build a list of the events it finds with the group code we set. In the “Event List” box press “Build List”. A list of the included events should show up. The Points System can include or exclude Courses and Clubs e.g. the competition is only running on certain grades or for clubs within the local region. 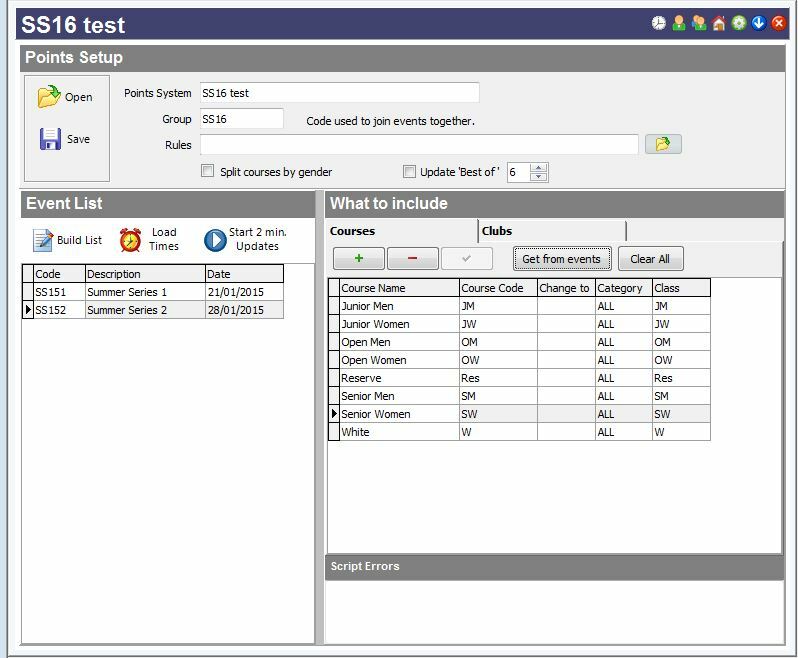 In this example we will include all courses so in the “What to include” box, on the Courses tab, press the “Get from events” button and it should populate the box with all the courses found in the events. Press Save to remember these. The “Change to” column can be useful to combine courses e.g. For results, you run a Red Short and A Red Short Vet but they need to be combined together for the points system. In this case the “Change to” column for the Red Short Vet can be set to “RS” ( the code for Red Short ). 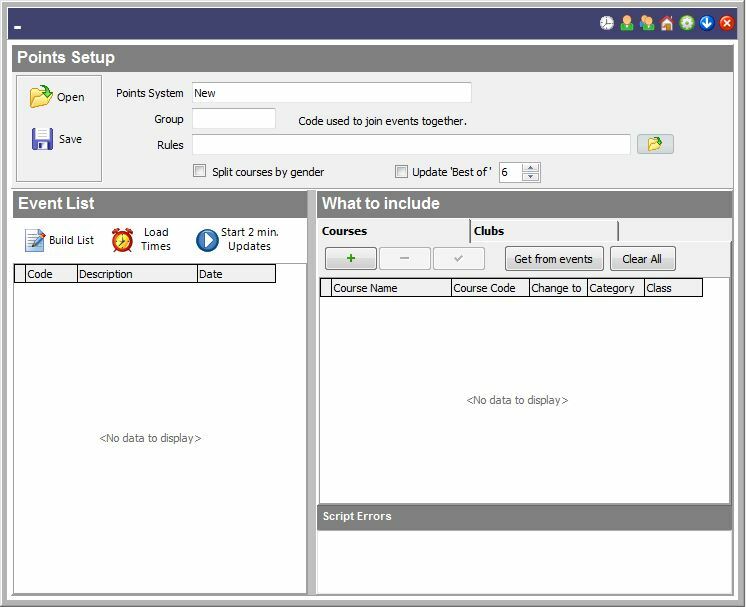 It can also be useful when the events you are combining don’t feature the same course types and so you need to combine the courses to a common code. Again, our example is simple, so leave the “Change To” column blank. If you have already run one or two event, you should now be able to start seeing results. Push the “Load Times” button to get O-Lynx to pull in the runners and times from the grouped events, followed by the “Start 2 min Updates” to add them up and monitor the current event for new times. To view the combined times, select the “2 people” icon and then the “Clock” icon. 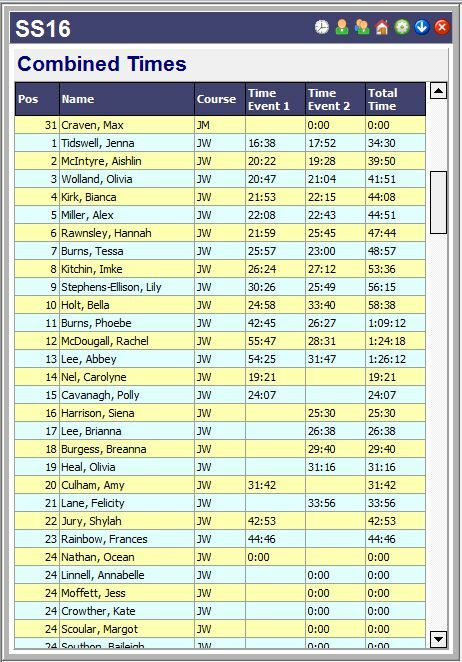 You should see a screen similar to that shown with a list of all competitors grouped by course. Now that you have set up and saved the “Points System”, to view the results again at the next event, just “Load” and then push the three buttons in the Event List box…. “Build List”, “Load Times”, “Start 2min Updates” … and then view. If you turn on scrolling – blue down arrow, tick “auto scroll”, note that the window will scroll by a course at a time, for better viewing of per course results.